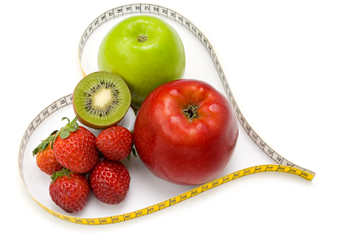 At MyNetDiary, we are passionate about healthy weight loss! We know that in addition to looking and feeling our best, losing weight is important for basic health. In fact, research also shows that losing even a modest amount of weight, even 10 lbs., is beneficial. Overweight people are at greater risk of heart disease, cancer, stroke, Type 2 diabetes, and high blood pressure. We firmly believe that there is no better way to lose weight and keep it off than to consume fewer calories. This idea is not just an opinion, but it is based on scientific studies that have tracked participants over several years. You can lose weight with any diet — low-fat, low-carb, or any other type — as long as your intake of calories is less than the number you burn. This concept is very important — you can eat the foods you enjoy, so you'll have the best chance for long-term success. MyNetDiary does not prescribe any diet plan; it merely helps you to learn how to eat more healthfully and achieve both short- and long-term weight goals. The very act of recording your daily food intake makes you more aware of your eating habits and helps you make better food choices. A recent study has shown that people who kept a daily food diary lost more than twice as much weight as those who did not record their food intake while dieting. This does not mean starving yourself or going hungry. You can burn 500 calories a day by eating less and exercising more, burning these 3,500 calories in about a week. Or, you may prefer to lose weight more slowly, losing 200 or 300 calories a day. This raises the issue of the dreaded calorie counting. Manual calorie counting is quite boring and requires a lot of time and willpower. Most of us simply can't do it manually. Typical diet software and the online food logs are not much better. Most of them are slow, cumbersome, and equally time consuming. We believe calorie counting got all the bad press because of these issues and not because it doesn't work! MyNetDiary is different. MyNetDiary was created by some of the best programmers who used to work for largest U.S. companies, designing state-of-the-art software. Yes, we know our craft. And we made sure to create the best calorie counter and food diary in the world. Our system is so easy to follow, that it takes almost no time to use it. In fact, it makes calorie counting painless. As the cliché goes, you have to try it to believe it. See also MyNetDiary efficacy report. We all see and know about the never-ending stream of diet books, fad diets, diet pills, and diet scams. MyNetDiary is different. Our approach is based upon academic research, scientific studies, and advice from practicing dietitians. We don't promise any miracles, but we promise to provide you with the best tools to help you lose weight healthfully and safely and, at the same time, establish a new healthy lifestyle. We've spent several years creating the best food database that has over 979,000 foods from the U.S., UK, and Canada, ensuring that you rarely need to enter food labels. With our unique food entry tools, searching as you type, you can enter your daily foods in a matter of minutes. Many people who lose weight eventually regain it. As recent research has shown, group counseling not only helps you lose weight faster, but also helps you keep the weight off. So, we have created an online MyNetDiary Community to connect you to other people who understand what you are going through. MyNetDiary Community gets you the support and motivation to help you stick to your goals. The Community Forum is supported by a Registered Dietitian. There is no need to drive to a meeting or weekly weigh-in since the Community and your support group are online and always available when you need them. We provide free, full-featured, and very easy iPhone and Android applications that sync with the website, giving you the flexibility of using a computer, iPhone, or Android on the go. Calories are the most important factor for weight loss, but to eat healthfully you need to keep an eye on other nutrients such as sodium, cholesterol, saturated fats, calcium, and so on. Unlike various point systems, MyNetDiary keeps an accurate track of 36 nutrients without lumping everything together and calling it a "point." Point systems used to be easier than actually calculating calories and nutrients, as these simplify the math. This is no longer true. With MyNetDiary, you can easily keep a tab on all nutrients, without any extra effort at all. Take a look around our website, test drive the website, or download or iPhone and Android applications. You can check out our videos and read testimonials of some of the thousands of people we have helped to lose weight. Read some of our articles below and find out for yourself. MyNetDiary can help you turn a new page in your life. We'll do everything possible to empower you on your journey to a healthier lifestyle. Please read MyNetDiary Library articles on Nutrition, Weight Control and Diabetes.